Big Test Today! Are We Ready For It? The African team swept New Caledonia aside on Thursday in a 3-1 win thanks to a blistering second half performance at Churchill Park. That sets up a potentially mouth- watering clash today, especially with Wellington Phoenix’s Roy Krishna back in the fold for the Fijians. The Vodafone Fijian football side had plenty of reasons to smile after breezing past New Caledonia in a 3-o win during a FIFA international friendly last Monday. Fiji had to do for large parts of the match, clinical finishing and a goalkeeping error. It gives the team momentum ahead of their arguably stiffer test against Mauritius at 3pm today at Lautoka’s Churchill Park. 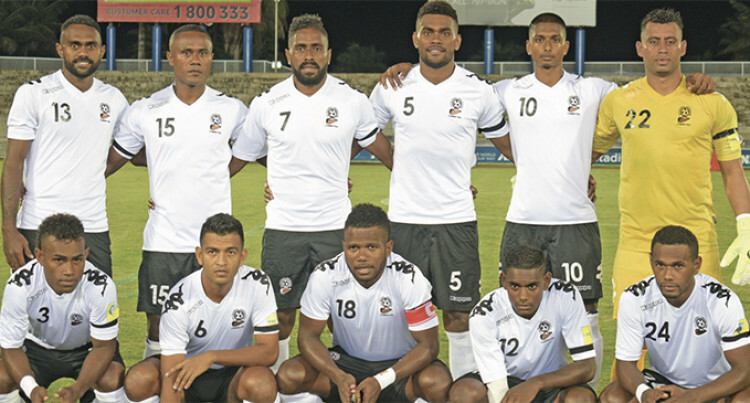 The only concern for Fiji against New Caledonia was their second half performance, as Christophe Gamel’s team closed the first with a 2-0 lead. The Bula Boys did not create a single chance until Rusiate Matererega pounced on a big goalkeeping error in the 90th minute for his goal. The midfield also began to crumble as New Caledonia’s more agile players imposed themselves but could not crack a dogged Fijian defence. Fiji set out in a 4-4-2 formation, with Gamel sacrificing creativity for brawn by deploying Nadi defender Ame Votoniu with Zibraaz Sahib in midfield. Canadian-based midfielder Nicholas Prasad was used at centre back for his debut, recovering from a nervy start to put in a good defensive shift alongside captain, Laisenia Raura. Prasad’s injury in the final moments of the New Caledonia match was a setback, although he may recover in time for Mauritius. Raura’s first match as captain– his 8th international cap– was one he would quickly want to forget. The Suva defender was red carded in the 78th minute for childish behaviour when he struck Les Cagous striker Roy Kayara off-the- ball, piling more pressure on his teammates. Perhaps the most encouraging of performances came from right back Kishan Sami, who combined awareness and skill to start attacks from deep inside the Fijian half. Sami is as comfortable on the ball as most of the attackers in the Fijian team, if not more. Surely he deserves a chance to play in a more forward position. Krishna missed the first game against New Caledonia due to his commitments with ALeague side Wellington Phoenix. His return to the squad could be key to Fiji’s chances against the Bonitos. Krishna, who is the only professional player in the team, will captain Fiji against Mauritius. He will likely start with Lautoka’s Samuela Drudru, whose two-goal performance against the New Caledonians earned him high praise. The striker’s inclusion should provide the Fijians with the added boost to make it two wins from two in the three-nation FIFA international friendly series. Mauritius is ranked 156 in the World FIFA Rankings, while Fiji sits on 169th place, its fifth lowest ranking since 1993. The match will be streamed live on Vodafone Fiji’s Facebook page. Please bring along your umbrella, raincoat and make sure to put on some warm clothes.